Capernaum is a town on the northern shore of the Sea of Galilee, with a port for its fishing industry. Jesus went there from Nazareth and found his first disciples, Peter, Andrew, James and John. Jesus left Nazareth and made his home in Capernaum, in Peter's house, after he heard that John the Baptist had been arrested. It was there Jesus healed the Centurion's servant, Peter's mother-in-law, the paralyzed man who was lowered through the roof, a man who was possessed, (see our Miracles of Jesus page for miracles 3, 4, 7 and 8) and many others who gathered to see Jesus. It was in Capernaum that Jesus directed Peter to catch a fish with a coin in its mouth to pay the Temple tax. On leaving Capernaum, Jesus condemned it along with other cities that had not heeded his call to repentance. 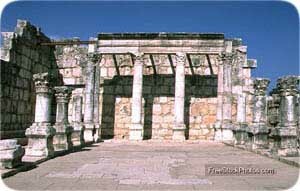 Today there is the remains of a synagogue from the 4th century. Also a short distance from the synagogue, a church was built in the 4th century over what is believed to be the house of Peter. Since then, a new church has been built on the site. Houses have been excavated in Capernaum dating to the 1st century AD. Capernaum appears in 16 Bible verses: Matt 4:13, Matt 8:5, Matt 11:23, Matt 17:24, Mark 1:21, Mark 2:1, Mark 9:33, Luke 4:23, Luke 4:31, Luke 7:1, Luke 10:15, John 2:12, John 4:46, John 6:17, John 6:24 and John 6:59.